This week's comics were released on Thursday rather than Wednesday due to some rabbit dying two thousand years ago (I think). Ho-hum. This is still in my Top 3 "Can't Live Without" comics. We're ten issues in and it still only feels like we're getting started. This issue sees future-Cyclops and company on the front lawn of the Jean Grey School For Higher Learning and he announces that he's opening the new Xavier School. As you can imagine, that draws a few responses. It's nice to see future-Cyclops step out from hiding and talk to everyone. He also shines a light on how everyone's feelings for him aren't as black & white as they'd like to make out. 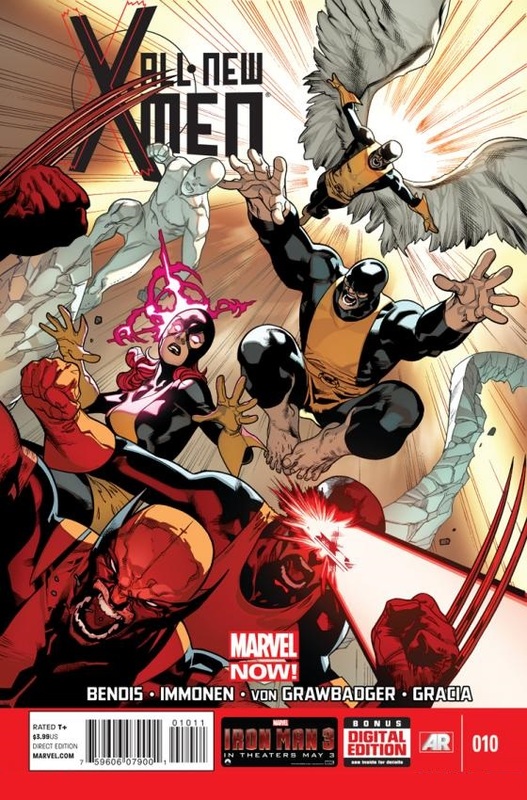 This understandably affects the past-X-Men team as they're still trying to figure out what the hell is going on in general. 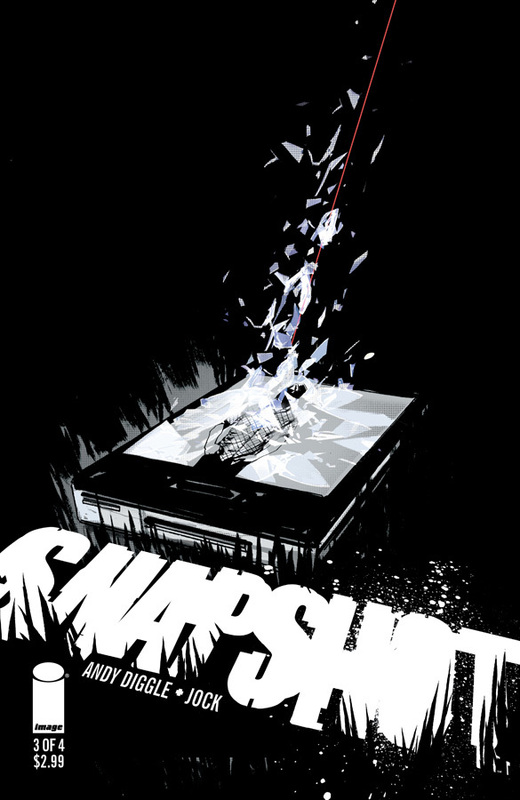 It's a great issue with a big cliffhanger ending and as always the art is just flawless. Can't wait for #11. The pace on this comic is breakneck to say the least. Let me point out just how amazing Jock's covers are. He is consistently one of the best cover-artists out there in comics and I know I'm not alone is saying so. There are times when I would kill for a little bit of colour or even shading in the artwork inside because one long-dark-haired teen looks a lot like another long-dark-haired teen and it makes for repeated confusion but it's still beautiful stuff. This is a comic of twists and turns. It started with a murder and will no doubt end in one too. Whose exactly, remains to be seen. Last issue is next month so not long to find out. I spoke before about how this comic splits it's time between science stuff and smashing things. I think it's done a great job at giving fans the best of both worlds. This is the first issue however when I started to want more science but it's only because I'm starting to notice a formula. "Start with some science > hint at a secret > get in trouble > Hulk smash > surprising conclusion". Now don't get me wrong, it's a formula that works. I would just like some more variation going forward. This time the "get in trouble" part involves some Frost Giants and a fake Thor. The fake Thor part particularly interests me and I'd like to see this open up into a bigger plot device. 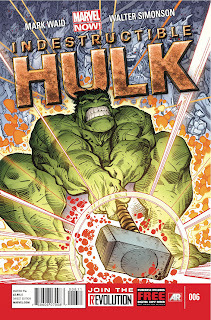 As the cover suggests, Hulk has to do some heavy lifting but we don't get the good stuff in this issue. That will unfortunately have to wait until next time. It's a tease but a good way to ensure that I come back. I'm really not a fan of Simonson's art. As blasphemous as that is to a comics fan, it just really bothers me. I totally know what you mean. Simonson is from an era where his more cartoonish style worked but these days... it just looks sloppy. Thankfully he's only on the book temporarily.